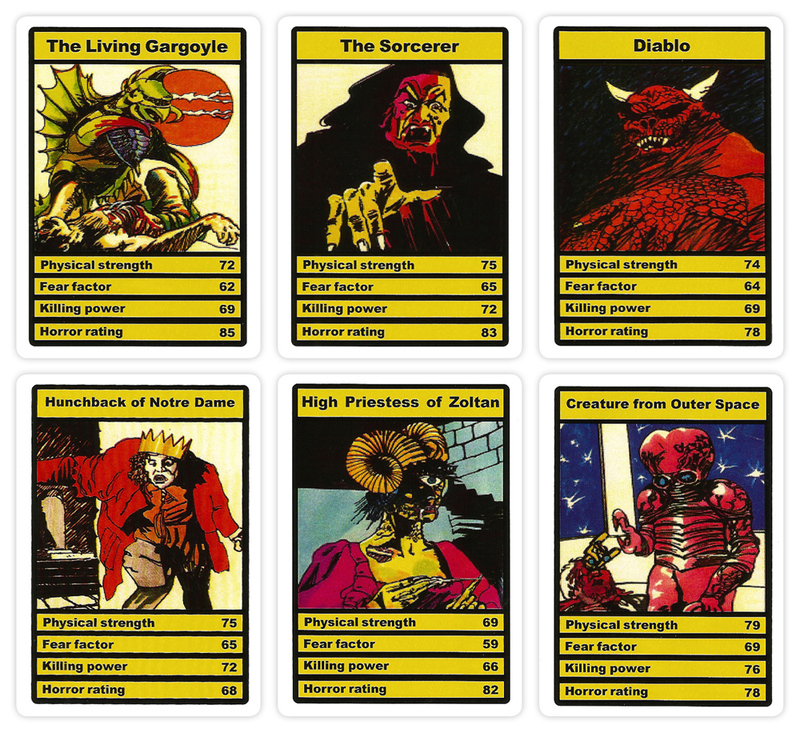 Top Trumps Horror cards, Devil Priest set (1978) | 'TAIN'T THE MEAT… IT'S THE HUMANITY! The Top Trumps craze swept UK playgrounds in the late Seventies and early Eighties as kids battled each other in games of statistic-based one-upmanship. Top Trumps featured a dazzling array of subjects, all squarely aimed at boys – tanks, cars, bikes, trains, warplanes, boats, etc – and packs from that era are much sought after by collectors. 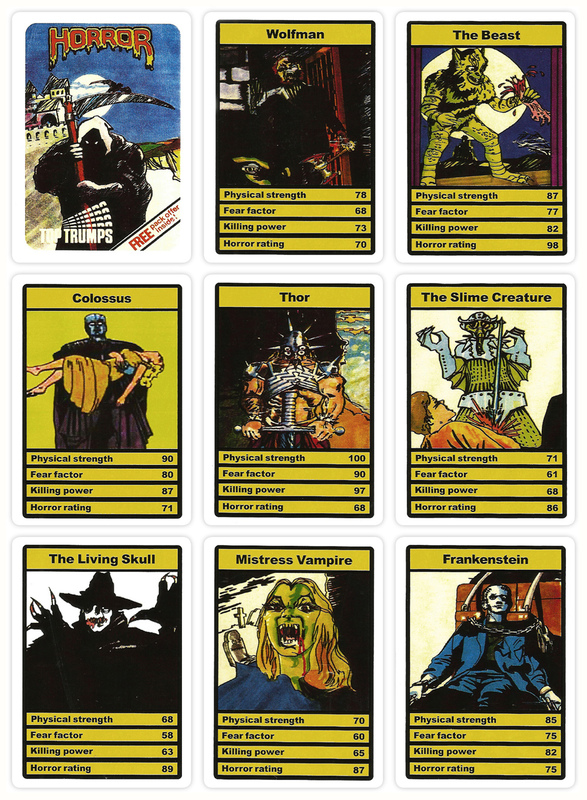 Arguably though, the most highly prized Top Trumps are the two packs of Horror cards released in the late 1970’s. The Top Trumps Devil Priest and Dracula sets were released in 1978 by German company Dubreq, who were responsible for another icon of Seventies nostalgia, the Stylophone. In the early Eighties Dubreq were taken over by game giant Waddingtons who repackaged those early games, only changing the company logo on the front card. Top Trumps games are still in production today but I doubt they generate the same level of excitement they did 40 years ago. The Devil Priest and Dracula sets each contained 32 cards measuring 59 x 92mm, as well as a rules card and a free pack offer. 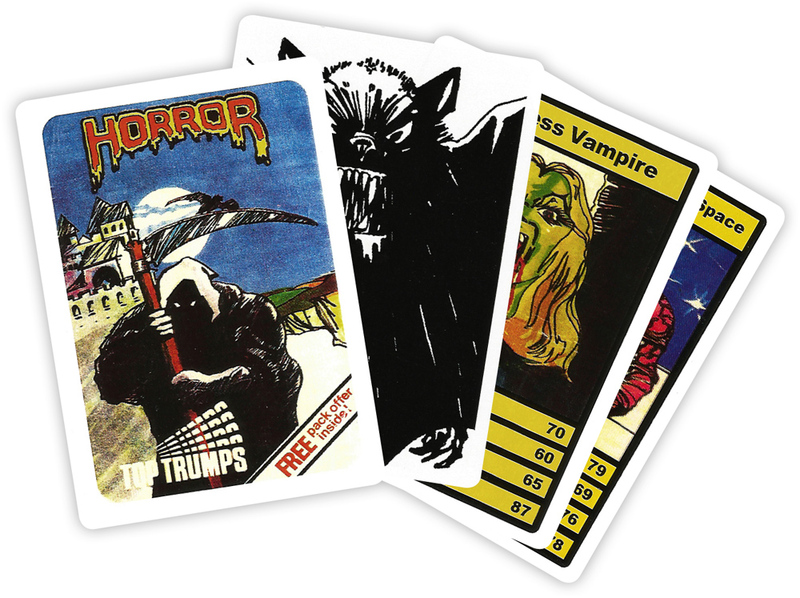 Each card featured a horror character with four stats: Physical strength; Fear factor; Killing power (subtle!) and Horror rating. The game was dead easy to play – all the cards were handed out to the players and the first kid picked a stat (usually the one with the highest value), and whichever player had the highest number in that category won all the cards in that round. The next kid in turn would then pick a stat and the game continued until one player had won all the cards. Simple. And in that simplicity lay its strength: games could be played almost anywhere (usually during school playtimes) and packs were pocket-sized making them easy to carry around. As for the illustrations on the cards themselves, well that’s where the main attraction of these two packs lies. Each card featured a graphic drawing of a monster and the artist clearly wasn’t afraid to depict blood and gore (check out The Fiend below). The art style of these cards splits collectors almost down the middle (pun intended), with as many championing the artwork as despising it. Personally I’m a great fan of the illustrations and they still hold a certain creepy fascination for me. I’ve scoured the internet from one end to the other trying to discover the identity of the artist but to no avail, which is surprising when you consider the amount of truly useless information on the web. (One site I visited did posit the theory that Stylophone spokesman Rolf Harris could have been the artist! I’m taking that with a Frankenstein-sized pinch of salt). Whomever the artist (and I suspect he or she was a freelancer as all the other Top Trump cards from that time featured photography) they clearly weren’t afraid to borrow from existing sources. And by borrow I mean flat-out steal. Many of the images will be instantly familiar to even the most casual of horror and science fiction fans: The Alien Creature is actually a Morlock from The Time Machine (1960); the Creature from Outer Space is the Metaluna Mutant from This Island Earth (1955); The Creature from the Black Lagoon is pinched, unsurprisingly, from the 1954 film of the same name and both the Fire Demon and Venusian Death Cell are cribbed from episodes of Doctor Who. I haven’t listed all the sources, but you get the idea. How Dubreq, and later Waddingtons, got away with such obvious copyright infringement is beyond me but I tip my hat to their sheer chutzpah. 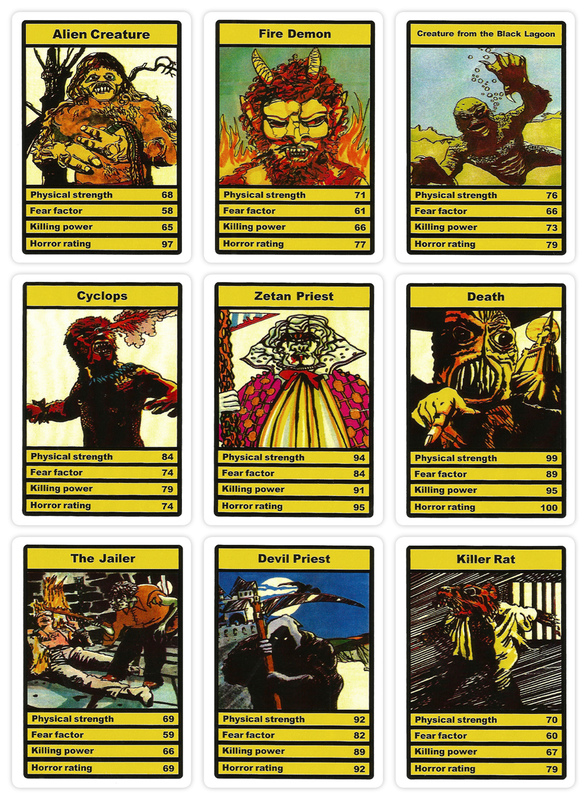 So here is the first set of Top Trumps Horror cards – the Devil Priest pack – in all its gory glory. And click here for the Dracula set.